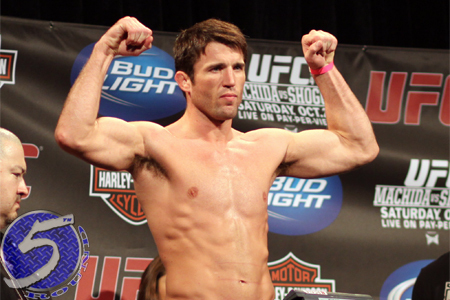 Rarely – no, not medium rarely – does Sonnen let an opportunity to retaliate go by the wayside. While serving as an analyst on this week’s edition of UFC Tonight, Sonnen fired back at Rampage in true Chael P. fashion. “Rampage has one fight left in the UFC and he isn’t fighting me,” Sonnen expressed. “I give you that answer because I am sitting here wearing my fancy suit, with an ear piece on and I have been branded an analyst on the number one UFC show on TV today. Sonnen was referencing Rampage’s offer to motorboat Karyn Bryant during an interview, his role as B.A. Baracus on “The A-Team” and the high-speed chase he lead the CHP on in 2008. Rampage is scheduled to close out his UFC career against Glover Teixeira at UFC 153.